When it comes to our ceramic tile patterns, you can personalize the design by selecting the right color and glaze for your specific project. You can even twist the direction of the tiles to create additional tile patterns. 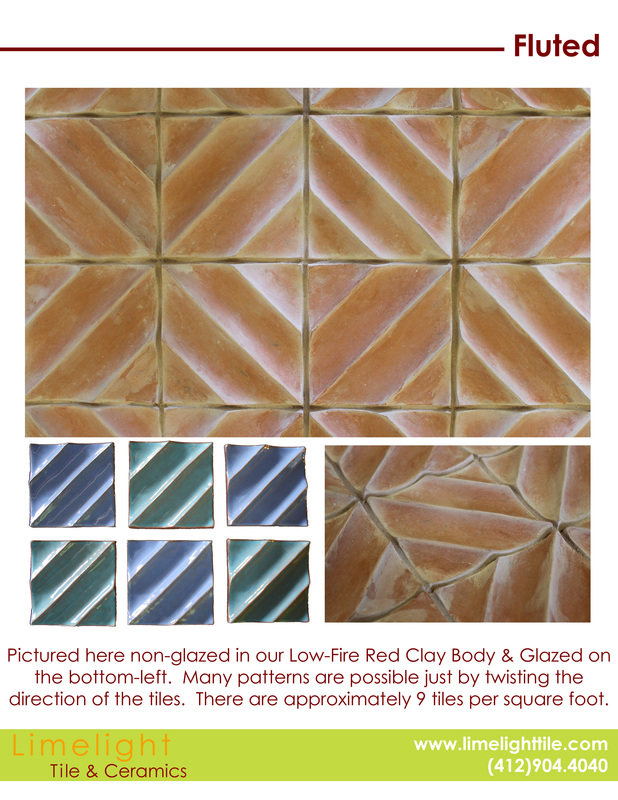 The Fluted tile shown below is in an unglazed red clay body and is approximately 4”x4”. On the bottom left, you can see how the Fluted tile will look when it is glazed. If you love the style of the Fluted tile, our team members can help you select the ideal color, glaze, and tile direction, so you can enjoy a unique look for many years to come. If you are in need of porcelain tile backsplash or custom ceramic tiles, you can turn to the team at Limelight Tile & Ceramics. Contact us to schedule a time for you to meet with our team members to discuss your exact tile needs.